The juvenile Pectoral Sandpiper, present at Pitsford Reservoir for the last week, was showing well at the bottom of the old road, close to Maytrees Hide and the feeding station this afternoon. Although this species is the commonest American (or Siberian) ‘vagrant’ (actually it’s just a scare passage migrant) to our shores, this one is easy to see and well worth a look if you haven’t seen it yet. 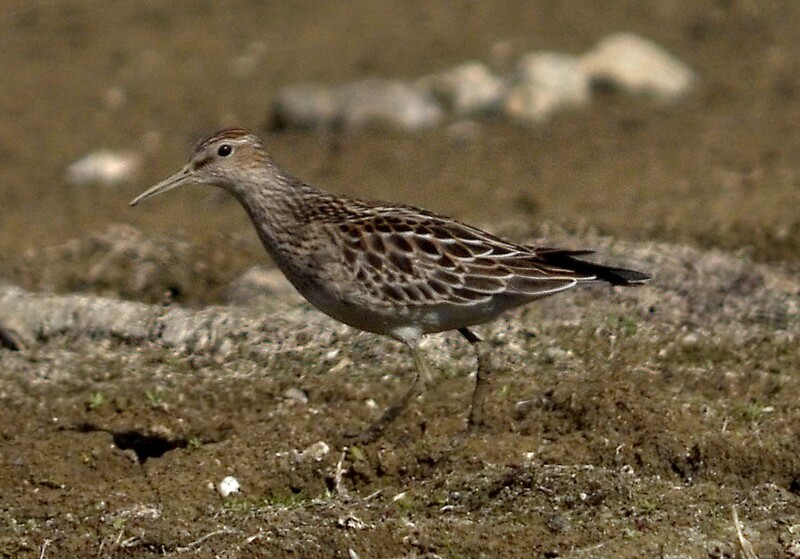 Pectoral Sandpipers are now annual visitors to Northants and, since the first one in 1940, there have been more than 40 records. 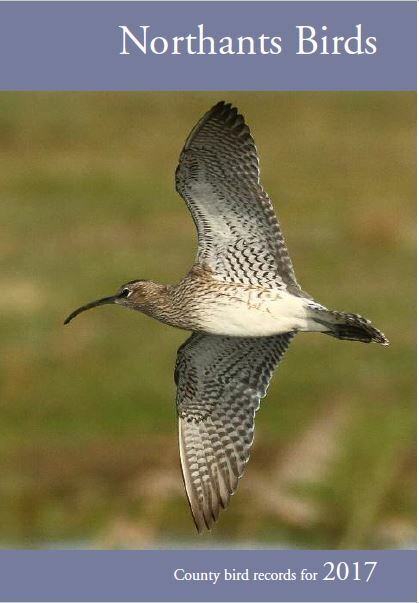 At 36, Bob Bullock holds the record for the person to see the highest number of individuals of this species in the County – 36 birds, that is, not Bob – he’s a lot older than that! 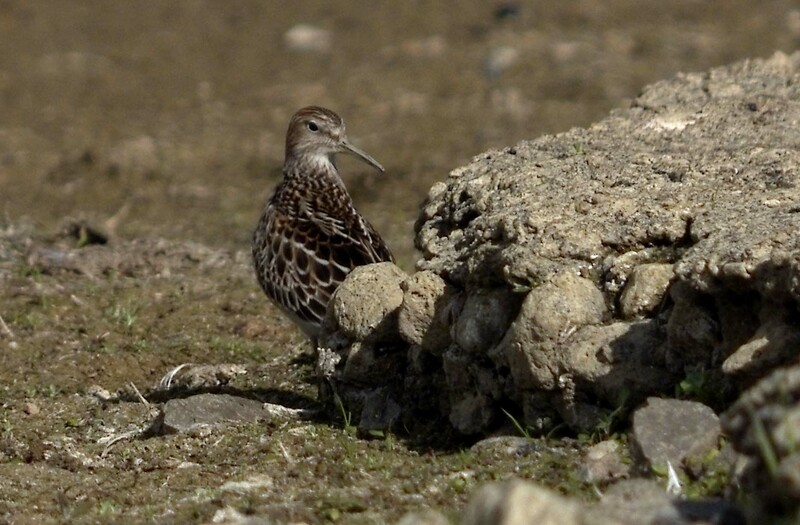 When not feeding out in the open, Pectoral Sandpipers often like to hide – either amongst emergent vegetation, old tree stumps or general littoral debris. On this occasion this bird chose to hunker down in the crumbling edges of the old road, which disappears into the reservoir near the feeding station and emerges again on the opposite bank, near the mouth of the WalgraveBay. I managed to get a few photos. Looking around … Decides to go … Makes a run for it! 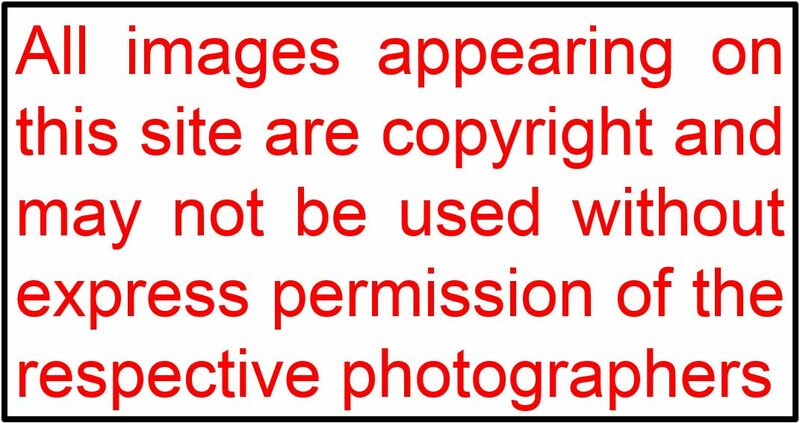 This entry was posted in Waders. Bookmark the permalink. Nice piece Mike! Bob does look 36 though. Opticians on Thursday. 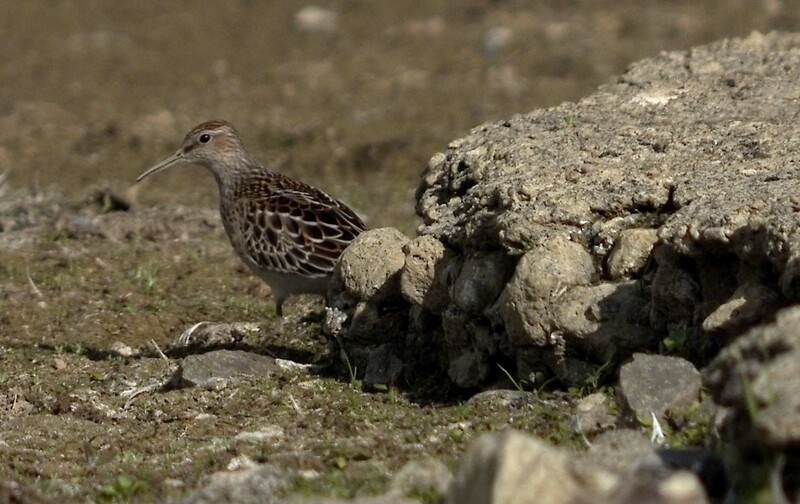 Pecs – and White-rumped Sandpipers – are expanding their breeding range(s) eastward from Siberia towards Russia, and are probably now migrating SW through Europe to (presumably) winter in Africa. This remains to be proved – a ringing recovery or two would help! – but my impression is that both species occur more frequently in the east of the UK than would be expected if they all came from north America. Thanks for the comment, which does suggest why Pecs and White-rumps are often found in eastern UK, although the east coast occurrences have been happening for many years now. Looking forward to seeing one of the latter in Northants!